1/32 EC#145 and EC#146 each contain 1 waterslide decal sheet of serials, nose art and other aircraft-specific markings, 1 decal sheet of national markings and Hamilton Standard propeller logos, and 1 x A3 fold out full-colour instruction sheet with marking options for three aircraft. 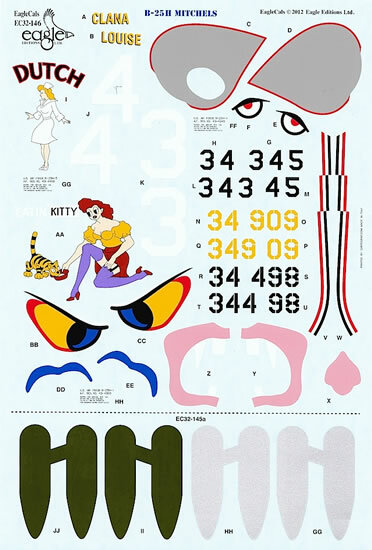 1/48 EC#145 contains 1 waterslide decal sheet of national markings, serials, nose art and other aircraft-specific markings, and 1 x A3 fold out full-colour instruction sheet with marking options for three aircraft. Advantages: Interesting aircraft choices; comprehensive instructions; perfectly printed decals. 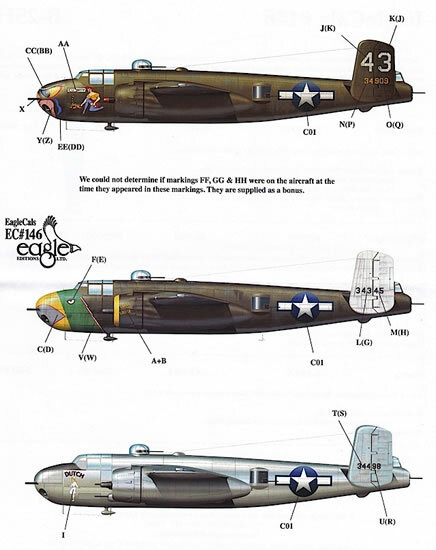 Conclusion: These sets are welcome additions to the available range of 1/32 and 1/48 B-25 decals – highly recommended. 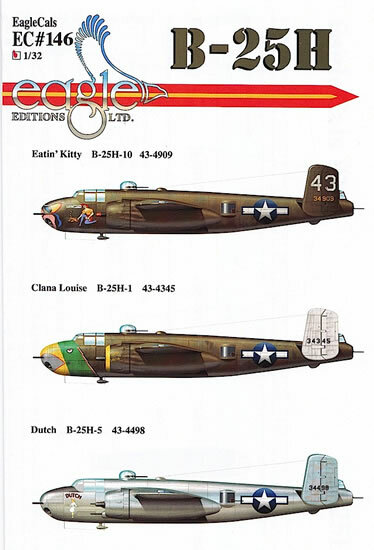 EagleCals’ new 1/32 B-25J and B-25H decals are aimed squarely at HK Models’ recent and upcoming kits, while the 1/48 B-25J release will be welcomed by modelers who have one (or more) of the old Monogram kits in their collection. B-25J-22 ‘Fatso’/44-29588 of the 500th Squadron, April 1945. 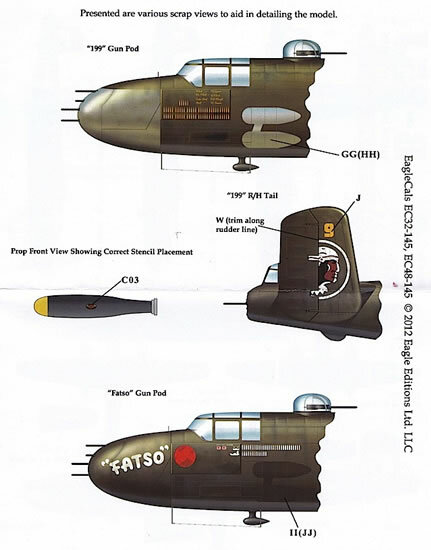 This aircraft carried a white identification band on the fuselage just aft of the wings; the name ‘Fatso’ was applied to both sides of the nose in May 1945, but removed shortly afterwards. B-25J-11 ‘199’/43-36199 of the 501st Squadron, July 1945. ‘199’ was flown by 1st Lt Ralph Blount on 28 April 1945 when the squadron won a Distinguished Unit Citation. The eight-gun nose was a replacement item that was never painted. B-25J-32 ‘Betty’s Dream’/44-30934 of the 499th Squadron, August 1945. This B-25J is famous for its role in escorting the G4M Betty aircraft that carried the Japanese surrender delegation between Japan and le Shima. 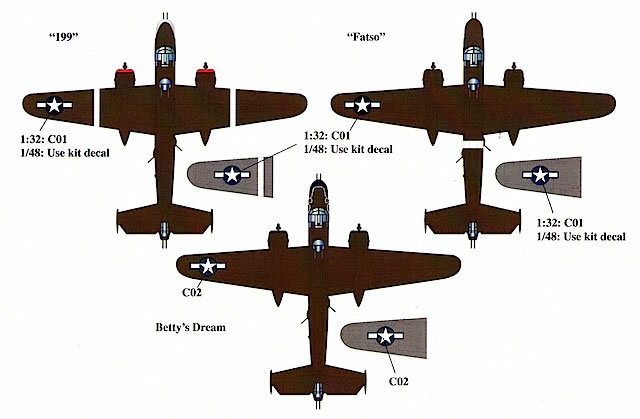 Modellers completing ‘Betty’s Dream’ will need to match Insignia Blue paint with the colour of the bat’s wing decals, because the curves of the B-25J nose mean that EagleCals can’t supply a decal for this part of the scheme. B-25H-10 ‘Eatin’ Kitty’/43-4909 flown by 1st Lt Charles Matheson of the 12th Bomb Group and based in Foggia, Italy in October 1943. This Olive Drab/Neutral Grey aircraft carried a stunning combination of nose art. B-25H-1 ‘Clana Louise’/43-4345 of the 498th Bomb Squadron, 345th Bomb Group based in Nadzab, New Guinea in May 1944. Also Olive Drab over Neutral Grey, ‘Clana Louise’ was assigned to the 498th BS for combat evaluation purposes in April 1944 and carried very colourful ‘hawk’ nose art. 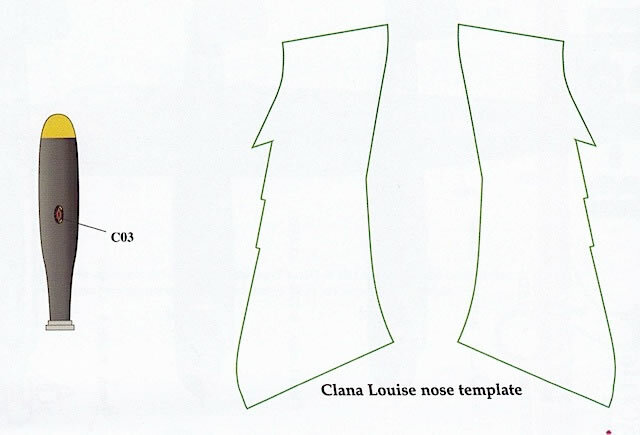 Templates are provided to assist with painting this nose art. B-25H-5 ‘Dutch’/43-4498 flown by 1st Lt Donald Robertson and based in the Southwest Pacific, 1944. This natural metal B-25H had an Olive Drab anti-glare panel and comparatively restrained nose art. Full colour port profiles and overhead views of all aircraft, with decal placement locations clearly indicated. Scrap views showing correct underwing national marking and propeller logo placement, and relevant individual aircraft details. Detailed information about each aircraft, which includes references for anyone who wants to conduct further research. 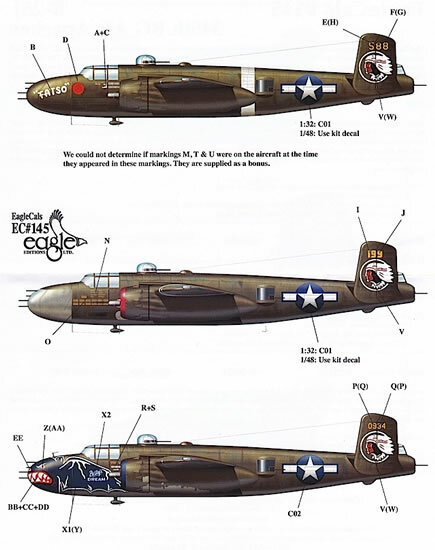 The 1/32 B-25J and B-25H releases include two decal sheets – one of serials, nose art and other aircraft-specific markings, and another entitled ‘B-25 common’ containing enough national insignia for two aircraft, and a large number of Hamilton Standard propeller logos. 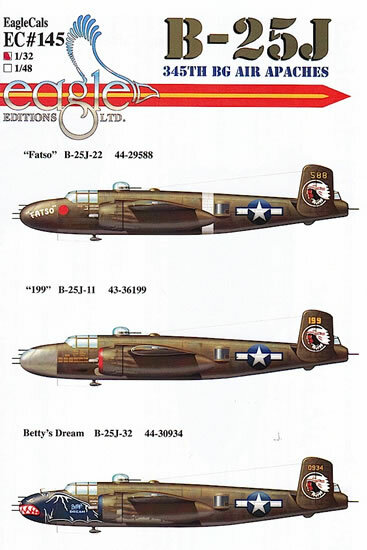 The 1/48 B-25J release contains one sheet that includes serials, nose art, aircraft-specific markings and propeller logos, as well as two-tone blue national insignia for ‘Betty’s Dream’. Modellers completing ‘Fatso’ and ‘199’ are instructed to use kit-supplied national insignia on these aircraft. The decals have been printed by Cartograf and look excellent on the sheet. I examined all five sheets and found no flaws of any kind. Printing is crisp and colour density appears to be good. 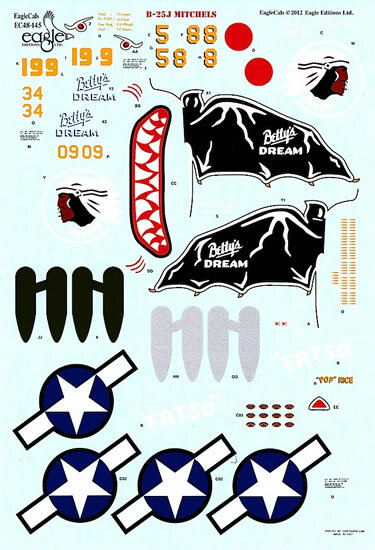 There are some large decals on the 1/32 sheets – particularly the national insignia and ‘Betty’s Dream’ nose art – so before you tackle these it might be worth applying some of the smaller decals to get a sense of how the decals perform overall. 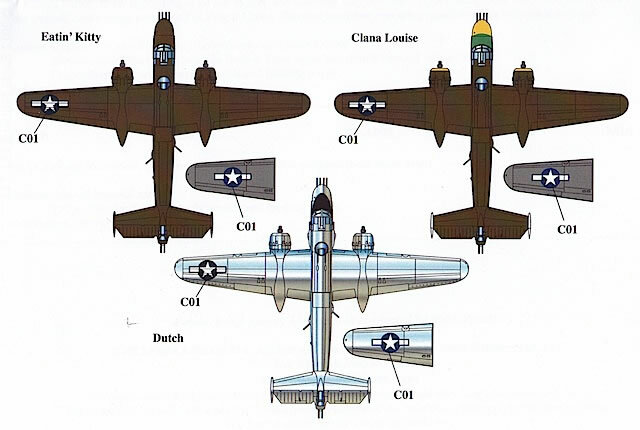 Both the B-25J and B-25H sheets include decals to represent the underlying colours revealed when side-packet guns were removed. I can highly recommend EagleCals’ 1/32 B-25H and B-25J decals to anyone contemplating building the HK Models’ kits of these aircraft. 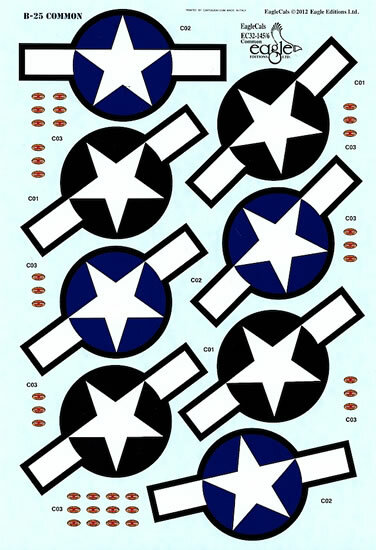 EagleCals’ 1/48 B-25J sheet is also a welcome addition to the range of B-25 decals available in this scale, and has got me searching the stash for my Monogram gunship kit.